The flag of Canada, when forced to 2:3 ratio, looses the distinct balance of the "Canadian pale", which is a (white) square between two (red) half squares. In 2:3 ratio, the side panels get squeezed proportionally, leaving a much narrower central area, where the maple leaf (equilateral in its normative depiction) must be reduced in order to not overlap the lateral panels and in the process a lot of extra white space is visible on the flag. There is a local hotel, not that far from where I live, and pass it every day on the way to work, that has at least 8 of these flying on the roof of the hotel (one at each corner, and 1 or 2 spaced out between the corner ones on the edge of the roof). However, it's even more visually jarring, not only is it 2:3, but it isn't even in Canadian pale, the bars are equal width! I guess a Peruvian civil flag with a maple leaf in the middle. Of course, no one notices, or cares. I've seen recently Canadian flags with two thin blue stripes between each red stripe and the white center. I saw this flag in Montreal twice at pro-unity manifestations and a third time as a bumper sticker. Anybody know what it this flag is? Possibly a reconciliation flag to incorporate the colours (blue and white) of Quebec with those of Canada (red and white). and also in Ottawa or Hull in last year's celebration of the Flag Day (the first one ever). I just was searching Yahoo! Canada looking for new flag links when I came across the Canadian flag with blue fimbriation at http://ourworld.compuserve.com/homepages/trcf/ [ed: currently www.trcf.ca"]. Unity Flag recognizing Canada's duality: French and English-speaking people together. French Canada and English Canada. Approx. 25% of the border is coloured blue representing the Francophones in Canada. This Unity Flag may one day become Canada's officially renewed Canadian Flag symbolizing "unity and harmony" on our national emblem. Le drapeau pour l'unité reconnaissant la dualité canadienne : les francophones et les anglophones ensemble. Environ 25% de la bordure [entre les champs rouge et blanc] est coloriée en bleu, et représente la francophonie au Canada. The same symbolism as the Union Jack making our Maple Leaf flag even more beautiful without losing our own identity. Un symbolisme identique à celui de l'Union Jack rend notre drapeau unifolié encore plus beau sans que nous perdions notre identité propre. Wayne Gretzky / Mario Lemieux.....Bobby Orr / Guy Lafleur.....Gordie Howe / Jean Biliveau. K.D. Lang....Shania Twain / Ciline Dion.........Brian Adams / Roch Voisine. No. 1 in the world......No. 1 dans le monde: Elvis Stojko / Jacques Villeneuve. Secondly it also revives the notion of a strong united Canada from "sea to shining sea". Deuxièmement, ce drapeau fait renaître l'idée d'un Canada fort et uni "de la mer à la mer". Ce drapeau pour l'Unité pourrait un jour devenir officiellement le drapeau rénové du Canada, symbolisant "l'unité et l'harmonie" sur notre emblème national. During the Canada Day festivities in Calgary, along with what seemed like the rest of the population of Western Canada, were downtown watching the fireworks and bands, and I noticed an interesting flag-related banner hanging from the lampposts. Hanging vertically (that is, taller than it is wide) was a banner that resembled the Canadian flag (thin red bar on top and bottom with a highly stylized red maple leaf in middle - looks like what a 10-year-old or so child might draw the maple leaf), but, interestingly, next to the (thinner than "normal") red bars is a thin blue bar (much like the "unity flag"! I am completely puzzled as to why this design was chosen! (From what I understand of this city, the Francophone population of Calgary is very minimal). The Unilisé is a stylized fleur-de-lis banner which symbolizes Quebec's historical ties in Canada. It is based on the international symbol of la francophonie which is the 'lis' (also 'lys', ref: lilly), as used in the Quebec flag, and the banner's design models that of the Unifolié (Maple Leaf Flag) which features one large maple leaf. It came about after the severe division caused by the Quebec separatist movement. At the height of the tension in the referendums of 1980 and 1995, Quebec's Fleur-de-lis flag was more or less hijacked by the separatist movement as their own. Pure wool Quebecers, of Canadian allegiance, would no longer fly the Fleur-de-lis flag because they would have been perceived as separatists, while others completely disowned it. Furthermore, the Quebec flag would never be flown by federalists without flying the Canadian flag along side it, to show their allegiance, two flags were always needed. (Notice the passé composé j'ai fleuri from the official je fleuris to symbolize the repatriation of the constitution in 1982 and the severing of parliamentry ties with Britain). The Unilisé was circulated among Quebec federalist groups in 1996, but has never been promoted otherwise. It was flown in Montreal in the big rally of Dec. 2000 where over 70,000 people, both French and English-speaking, protested against the anti-democratic, forced mergers of cities that was conducted by the governing separatist party. The Unilisé banner also flew along side the Canadian Duality Flag on the Bank Street bridge over the Rideau Canal, in July 2001, for Les Jeux de la francophonie in Ottawa/Hull. The bridge is located at the entrance of Lansdowne Park Stadium where the opening ceremonies were held and where the flags were seen by close to 20,000 people. When passersby questioned the meaning of the flags, 'blue in the Canadian flag and red in the stylized Quebec banner', the answer "mettre de l'eau dans son vin" (turn the rhetoric down a notch) was well liked, especially by Francophones. The Unilisé's colours are Quebec royal blue and Canada red. After a recent biker battle in Quebec, there was a TV report on the bikers, including the Hell's Angels. There, clearly blowing in the breeze, was fully extended Hell's Angels' flag - I wonder if it is an international flag, or a Canadian version. It was similar in design to the Canadian flag - 1:2, but with the red-white-red showing a bit more white that usual, maybe 1-3-1 instead of 1-2-1. The reason for this is that the maple leaf was replaced by a large brown winged skull, the emblem of the Hell's Angels. Is this flag known around, or is it a local phenomenon? I once saw a blue and white Canadian flag. It was the same as the current maple leaf, but was colored blue and white instead of red and white. This was in July, 1970, in Dwight Ontario. When I asked a local person why this flag was blue he said that it had been a rejected design trial for the 1965 flag. He also said it was a French-Canadian design. He was English-Canadian and got very upset about it. He said that this irritating French-Canadian person shouldn't be flying it. He was going to take it up with the town council that night. I never saw the flag again. I assumed that the design was French-Canadian preferred because of the blue color instead of red for the English. A rendition of the flag shown by Eric Radford and Meagan Duhamel after they won the skating championship. An image of the duo is archived here. A blue and white Canadian pale with a modified "Burning Man" festival logo for emblem, its usual diamond shaped head replaced with a Canadian maple leaf. The photos I have (sent or pointed to in this list a couple of years ago) show this flag, neatly manufactored at some 1×2 m, hoisted from a van or truck in (supposedly) the Black Rock desert (US-NV). Filename identifies this as the flag of Kanadian Broadkasting Korporation. It is said that this was one of the approximately 40 FM radio stations present at the 2001 "Burning Man" festival. 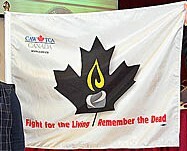 The new National Day of Mourning flag was created by the Canadian Auto Workers. 1.) The Provisional flag on display in southern Alberta, is 2 bi-colour; with a blue star on a yellow background. Adopted 1982. 2.) The five points of the star stand for the Canadian, British, American, French and Natives. 3.) The Chinook Foothills Authority represents under the CRU in the part of the southern Alberta. 4.) It has no territory, except a few buildings and other. The Republic of Western Canada has a flag. The story and the flag are here. Sounds a lot like a USA look alike. In the early part of the page, there is what looks like a flag, top half blue with four white stars, bottom half red and white stripes with some of them making a "mountain" on the hoist side. But down at the bottom, or on the page about the book, the cover shows a flag which is the USA flag with a large white maple leaf in the canton. I wonder which is thought to be the actual flag of the "republic" and if it is the one on the book, why have 13 stripes if they are only including the 7 western areas.? The image at the bottom of the page is part of an ad for a book called "The Republic of Canada", advocating that Canada, in its entirety, become a republic, a different proposal than what is advocated in the main body of the "Republic of Western Canada" webpage. So there are two distinct flag designs for two distinct political proposals. More precisely, an independent Western Canada modeled after the US political model (hence the two designs, although I think the book one wasn't meant to be the flag of an independent Western Canada, but merely an illustration for the cover to state their point with a graphic (and what better way than with a flag?). A striking flag example (on the website, not necessarily the book cover), if I do say, but as a Westerner I wouldn't support their model. Not that I'm against (or for) Western independence, just their stripe of it. I also don't think I'm alone, so those out there don't have to worry that the West will separate any time soon. I've seen it a few times, it appears to invariably be used by supporters of decriminalization of marijuana in Canada, the leaf in the middle is either red or natural green (I've seen both versions). It may also be the official party flag of the Marijuana Party, but that's merely speculation on my part. From an undated picture of a Toronto 420 rally (420 is code for marijuana) in the 4/21/16 Washington Post: https://img.washingtonpost.com/rw/2010-2019/WashingtonPost/2016/04/20/Foreign/Images/Marijuana_Rally-096e0.jpg?uuid=Ez2QHAdQEea9ywEz2hhBjQ. Lower on the image is seen a red-white-red flag with a thin green marijuana leaf on it. The maple leaf design comes from a vintage leaf shape chosen originally by Hockey Canada for use (along with the regular leaf) on the designs of the uniforms of the men's and women's National teams since their 2002 double Olympic gold victories. The specific shape was chosen as the one to represent past use and is associated with great success and popularity. It has come to be known as the "Vintage Leaf" and is now seen on flags (and elsewhere) in place of the regular maple leaf to produce the "Canadian Vintage Leaf Flag", an alternate leaf design to the regular 11-point one. In 24 hours, a free newspaper in Canada, there is a picture of a suggested mourning flag. The flag is the Canadian flag, but with the bar at the fly end recoloured black. The caption reads: "Dr. Richard. Hobart of Pembroke, Ont., shows the custom flag he designed ad a mourning flag for the soldiers killed in action or training. The flag, which he has flown when Canadian soldiers have been killed, has generated some controversy."